"Imagine if everyone could get around easily and safely, regardless of their ability to drive." Let’s start by taking humans out of the equation. This dream became known to the world as the self-driving car project. First off, let’s get some semantics out of the way. We are talking about fully autonomous vehicles which can drive us from point A to point B without any interaction from our side, safely and efficiently. Yes, vehicles such we saw in the Demolition man (1993), Minority report (2002), i-Robot (2004) and most recently Hot tub time machine 2 (2015). Once again, the movies show us the way, technology makes it happen. Big companies such as: Google, Mercedes, Audi, GM, Tesla, Renault, Honda and Toyota took a keen interest in the subject back in 2008 and paved the way for the various self-driving prototypes. The most famous ones, cutely nicknamed “bubble cars”, are designed and tested by Google to navigate through city streets, avoid pedestrians, cyclists and duck-chasing grannies (true story). They use the mixture of sensors, 3D laser-mapping, GPS, and radar to analyze and interpret their surroundings, and the latest versions are fully electric with a range of about 100 miles. 1 million miles of testing and 14 minor traffic accidents on public roads (all reported to be human errors), inspired some smart people to explore future uses of this novel type of transportation, once the legal obstacles are out of the way. Just for fun, we launched a challenge at our Innovation Cloud idea management software and invited some smart people for a 3 hours of the online brainstorming session. We asked the question: What is the Future of Self-Driving Cars? 20 of our carefully selected people were invited to share their opinion. They all did a 30 minutes research on the topic and came back to the online idea management with their ideas to compete for a reward: Innovation Cloud PRO 50 account. Winner is yet to be declared. Social inclusion and Health assistance. Aging, visually impaired and disabled will get a chance to improve their life conditions and gain more mobility. 45% of disabled people in the US still work. Elderly people would gain access to different kind of transportation. Parking will become obsolete. Omg, how? It is a fact that cars spend 95% of their lifetime parked. If a car comes by and takes us to the desired location, it goes to pick up another person, eradicating the need for parking, parking lots, parking time and parking costs. They will be constantly on the move, as new passengers will request its presence. Going to work, game or a wedding? No more parking stress. Killing traffic congestions. When the majority of the vehicles on the road is autonomous and also able to talk with one another, high-speeds, formations, and seamless merging could be possible. At intersections, smart stoplights could automatically turn to green, if no other cars and pedestrians were approaching, which would smooth out traffic flow, reduce idling, and decrease accidents. Reducing death rate. Approximately 1.2 million lives are lost due to traffic accidents worldwide. 94% of accidents in the U.S. involve human error. In the UK, KPMG estimates that self-driving cars will lead to 2,500 fewer deaths between 2014 and 2030. With autonomous cars and smart infrastructure, this can be much reduced. It is all worth it, if these cars save even one life. Solar powered bliss. The current infrastructure of roads and highways will almost definitely evolve to host all the possibilities that autonomous driving brings to the table. Electric cars could be recharged without stationary cells. What if the whole road became a Smart highway? An interactive road that melts snow during the winter, constantly recharges cars on the go and provides heads up of the dangers detected ahead. More time for yourself. If by 2020 you are going to be glued to a back seat with no traffic stress, you gain access to some free time. Cars will give you enough fun features to engage on the longer and shorter routes: games, movies, documentaries, education courses, books, music and news. Or just sit and enjoy the view as thousands of little bubble cars go about their jobs in perfect harmony. Smooth delivery system. From groceries and stores delivery to the big autonomous trucks and cargo planes, delivery system will have much to adapt to. Automatic medical appointments – Sending a vehicle on time to transport elderly to a medical treatment and back, based on the medical record and schedule. Detecting Health issues – Sensors that would detect if someone is having some health issue and notify emergency institutions to prepare for a new patient. Grocery shopping and Fast food delivery – Companies will be working side by side or be spun off from self-driving automotive companies. They would pick up an order and send it via self-driven car. Payments could be made through the car itself. You can see in the car via Wi-Fi and car camera. You pay with Google Wallet. The car puts on airco, if things have to be kept cold. RFID scans products to see if all is there and sends the vehicle out. Smart maps – Equipped with google maps and location-aware technology self-driving cars would suggest best routes and places which support the needs of the disabled and visually impaired to assist them and ensure easier access to their desired location. Surprise me App - You have an afternoon off: click on the button in "Surprise me" app. You type in that you have time from 14:00h until 18:00h. The car comes to pick you up (it knows where you are and invites you through the app). It drives you to a fun place (It knows what you like via social profile and so). A bar/drink is in the car with your favorite drink. It will get you home by 18:00h taking in account traffic jams and road blocks. What to see App - You are first time in a city, town or a village. Just call in the car to guide you through it, showing you places other tourists found thrilling. Car to car and car to infrastructure communication – would allow mapping of the car positions and enable optimization in terms of speed, formation and direction. Car to infrastructure communication would smooth transition at intersections, warn of any dangers and propose better routes. 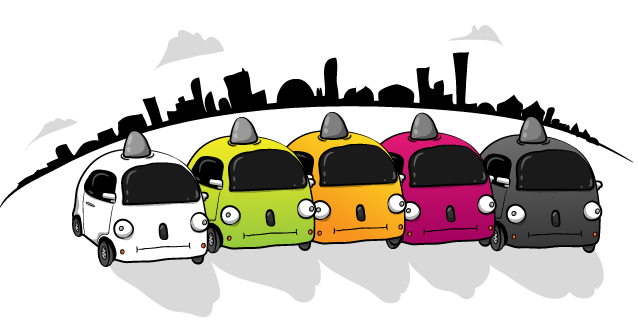 Customize your Bubble – Well, in my view, self-driven public cars are one thing. Private ones can come with full range of customizations in size, color, speed, design and comfort. Actually, public ones would be cool to customize for longer routes. Purple tiger skin? No problem. Still, it might take two decades for people to definitely outlaw driving cars and replace the current fleet according to Elon Musk. There are issues yet to be resolved, but we took the most positive note and tried to envision the driverless future we look forward to. Do you have any idea to add? Please, share it in the comments. Want to launch an idea Challenge of your own design? Grab a free Innovation Cloud account and start now.